All soil found around the United States include different combinations of the following three things… sand, silt, and clay. With that said, the soil type that’s best for a earthen water filter to remove radioactive particles is that with a high clay content. Clay binds well to radioactive particles. If radioactive fallout has contaminated the water supply, earth filters utilizing clay type soil, will do well at removing radioactive particles from the water. According to the American Civil Defense Association, this method is better than distillation, ion-exchange filters, or charcoal filters for this purpose. 1. Perforate the bottom of a 5-gallon can or wastebasket with holes punched within 2 inches of the center. 2. Place a two-inch layer of washed pebbles on the bottom of the can. 3. Cover the pebbles with one thickness of terry cloth towel or other porous cloth. 4. Scrape the top 4-5 inches of soil off the ground to get below the fallout, and dig enough clay-type soil to fill the can to a depth of 8 inches, packing it tightly against the sides. 5. Cover the soil in the can with another thickness of toweling and another one or two inches of pebbles. 6. Suspend the can over a clean container and pour the contaminated water into the top. Water that is free of radioactive particles (but unpurified) will filter out the bottom at a rate which depends on your exact soil. Discard and replace the clay soil after approximately 10-gallons of filtered water. Clay soil is composed of very fine particles, usually silicates of aluminum and/or iron and magnesium. Clay soil absorbs water slowly and then retains it for a long time. Wet clay soil is heavy and sticky, and tends to swell from the added moisture. When dry, clay soil shrinks and settles. The top layer can bake into a hard, concrete-like crust which cracks. Does my soil have clay in it? 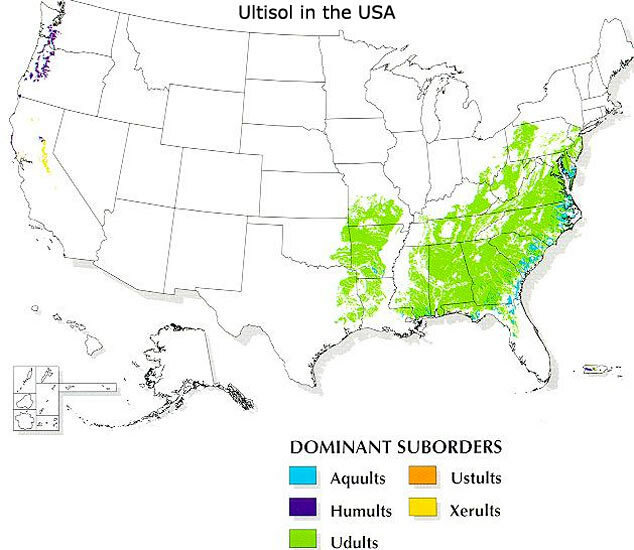 The following maps show where in the United States there is some clay in the soil. 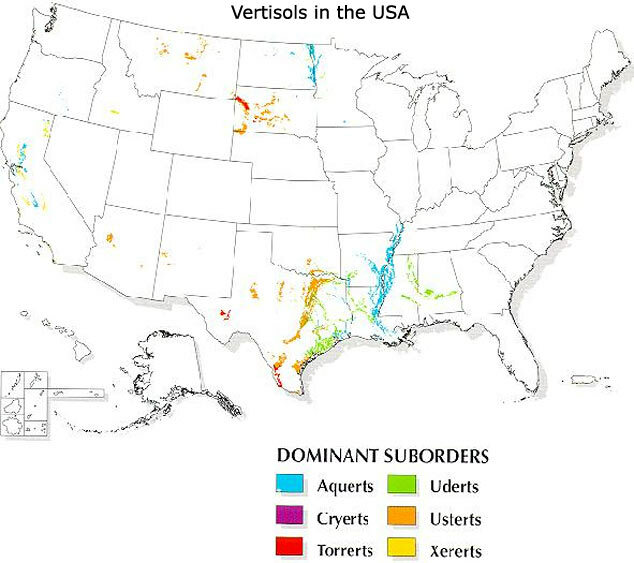 Note: Just because the maps shown below may not indicate clay in your geographical area does not mean that there is no clay around… Most of us have encountered clay at one time or another and since you likely know what it looks and feels like, you will know it when you see it (or dig for it). 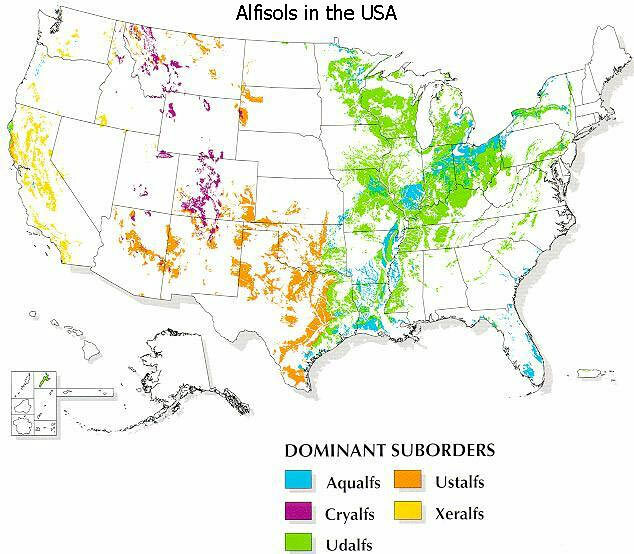 This type of soil contains the highest percentage of clay compared to the others in the subsequent maps shown below. This type of soil contains a clay enriched subsoil and is more widely found. This soil also contains a clay enriched subsoil. Ok… Here’s a link that explains the soil types a little better. This is very important info that I didn’t have. Whether it would be caused from High Attitude Bomb used to create an EMP, a surface ignited dirty bomb, or Nuclear Power Plant failure. Unless you have an underground bunker stocked to the hilt, everyone will need this info. Question will this method also work for moderate chemical/acid comtamination?? Would testing the filtered water with litmus paper help? In the US we have Sulfuric acid redistillation plants. These take spent sulferic acid, distill it to make new acid for the paper pulp mills and oil refineries. Some of these plants are located near rivers that sometimes flood. Thats Sufuric acid!! Just one company has these plants in Riverton,WY, Beaumont,TX, Shreveport, LA, Oklahoma City, Cleveland,OH, These are scattered throughout the US and utilize rail, trucking as a mode to transfer products. Another industry is the galvanizing plants that are throughout the US. These have acid trucked in. Accidents and natural disasters happen that can adversely effect us even after SHTF!! This is one possible way of having to deal with it without having a lot of expensive equipment! also good, it is the sort of info which is fairly easy to remember…If caught out, I think I could recall a fairly close version of these instructions. check out zeolite. it also takes water out of gas. the US that does not have clay. RE; zeolite,…IT does come in food grade! sorry, should have been more clear..
have read quite a few articles in past few yrs, re zeolite..as well as some of it containing asbestos, apparently the zeolite itself can cause much the same problems..(so some say). I think it is the dust from the zeolite. here is a bit from a cancer site. “A study conducted by McDonald and McDonald in 1980 indicated that some 25 to 33 percent of all cases of mesothelioma cancer have no connection whatsoever to asbestos exposure. However, studies have been made that zero in on some other specific causes. One of those is exposure to zeolite. Known in scientific terms as hydrated alkali aluminum silicate, zeolites are a group of minerals that contain mostly hydrated aluminum and silicon compounds. Their common names are Clinoptilolite, Erionite, Phillipsite, andMordenite. They are found in volcanic rock and ashes and sometimes used as additives in animal feeds. Because of their porous structure, zeolites may be used as absorbents, desiccants, detergents, and as water and air purifiers. Zeolites have enjoyed some use in the health field as well including as dietary supplements for hangovers and an adjuvant therapy for various types of cancer. (These are not FDA-approved treatments.) However, there is a lack of data supporting zeolite’s efficacy and there is no conclusion as to whether zeolites are safe, as the mineral’s systemic effects on the body are not totally clear at this point without more research. What is clear, however, is that exposure to zeolite dust is associated with an increased risk for developing malignant mesothelioma. Simply put, zeolites are carcinogenic when inhaled. As a matter of fact, the International Agency for Research on Cancer lists zeolite as a Group 1 Carcinogen, a categorization used when there is sufficient evidence of mesothelioma carcinogenity in humans. Just pull it out of the bag with a large scoop, Do not put your head in the 25# bag, put in place, layered between 2 layers of a clay, there will be no dust. after it is wet silica does not fly. I read not too long ago that the west coast is already being contaminated from the Fukashima power plant, from contaminated rain water. So this is good info to have if you live on the west coast. Although I guess everywhere will be affected eventually. We have been keeping a “log” of radiation readings since Fuki went ballistic. You should see the “spikes” we have recorded during weather events. Just yesterday we were spiking well into the 125-140 range due to a pacific storm delivering snow here in CO. This tells me it is in the pacific coast atmosphere! We have several kids in Cali so we try to keep them in I95 masks for days with alpha spikes….we wear them here too, and augment our cattle and horses with iodine when these spikes appear. the radiation readings this week are NOT GOOD! sorry that is N 95 masks not I. don’t know where that came from! Where did you purchase your radiation device? We have taken it with us to measure the space around the kids homes in Cali, AZ, MI and VA as well as our Metro Denver kids homes. surprising the readings we get. Not encouraging. Thank you for the information. We are in the(hopeful)State of Jefferson, northern CA. We can watch the storms roll in to our area from the coastal region, we need the rain but not the fallout that comes with it. I read that up midwest snow already has many time nml.rad levels. there is a table with measurements on a website somewhere. Already well across the country thanks to added contamination and playing with weather control. Using clay soils in a filter take a long time to “perk” compared to other natural filter sources because of it’s compact density. Many of our lakes up here have a blueish clay about a foot under the sand and silt lake bottom, and I found tiny bits of charcoal imbedded deep in the clay from a fire thousands of years ago. Not so good for sculpturing picking out the bits, but maybe better for filtering out radioactive particles. Thanks for the tip. Oh wow, thanks Ken. My soil has enough clay to make me hate life whenever I have to plant something. Good to know that it has some useful properties. The old revision is also in the public domain, and can be downloaded for free. Where can I download the old version free? Gutenberg? Thanks. I’m reading it now. A lot of good information, and a lot of things no one could have anticipated in 1979–like how dependent we’ve become on electronics. No one at that time could have imagined that an EMP would do more than knock out the electrical for a few radio stations. The idea that it would entirely stop traffic across the US would have been laughable. We have no more air-raid sirens, we have no more EBS system, and the “grain belt” of the midwest is no longer. Ken, another great post.Information all should have.Especially for water. I’m running into more people who basically have given up on surviving any type of disaster/incident.What has happened to people’s self preservation genes? I have material on hand to make clean rooms.Filters,fans,heavy plastic.I purchased clay just to make water filters like in this article. I had a guy call me a f***ing nut a week or so ago.I was talking about flu outbreaks and the importance of having masks,food water at home.What set him off was when I mentioned the nuclear disaster in Japan.He believes there is absolutely no danger coming out of Japan. He stated that if something happens like that in his area he would take his children and wife out to be exposed together.That way, they would die together.Tried to point out how horrific/painful that type of death is.Suggested he buy a gun so he could end his families pain and then himself.I think he envisioned some romantic death for him and his family. I guess I burst his bubble. But hey, I’m the nut.But this “nut” will protect his family to the end. Thanks again for all you do Ken. It is a sad indicator of our society when people call others f’ing nuts for becoming better prepared. It further exemplifies the danger we are in (so many blind people). Got that right? Any chance that kitty litter could be used? It is clay. Those with no self-preservation genes used to die off long before they had children. With the advent of modern technology those who would once have died are allowed to survive and have as many little sheeple as they want. They can just move into the city and let the gov’t take care of those pesky details. So they interbreed, and like any other recessive gene they end up with birth defects that compound and reinforce their tendencies. We live in a sheeple farm. I will make one of these filters within the next week to get an idea of how long it takes to get water filtered thru it. Gotta practice this if it might save my life sometime in the future!! don’t have to use it for its suggested purpose. of the World as We Know It…hope you get a pfennig out of it. It’ll provide some light reading for the next couple of months. Thanks Ken for a great article and especially for this site. Kaolinite is the easiest clay to obtain. It is sold by the bag everywhere in dry form. It’s cheap and no shovel work. This stuff was heated to cause it to expand to absorb liquids. To use it just add water. Just like your cat does. What about Tritium (radioactive hydrogen)? It can be part of water. Can’t filter that out. Even though it has very low energy emissions, it can literally bathe every cellular function and DNA in radioactivity at point blank range. something else to consider, and I have no idea how one would check, but your local clay may be good for much more than Radioactive sieve and Clay Pots. I have heard for years, of folks who use clay medicinally, from many parts of the world. Also have heard for years about clay deposits/ clay baths on Native Indian Land in British Columbia (and other places) that is supposed to be healing for many conditions. anyone know how to test one’s own clay ? I use clay daily…two 10 ounce glasses…had chemo a while ago and went white haired in a few days. Since I started taking it, it has pulled out all the chemo and I got my natural hair color back. Also, my joint pain is gone too and my digestive system is back on track..takes at least couple of weeks to drink before you see results bit it worked for me. I use the food grade bentonite. I guess you can get test strips from some lab supplies stores online, pop it inside a chunk and read out the results later to make sure it does not have adverse impurities. where does one purchase this? Health food store? Farm Feed Store? how much do you put in a glass of water? do you mix in blender, or will it “stir up”? you say your arthritis went too? you say you had cancer treatment…Are you on any post treatment meds? I find it really interesting about the arthritis disappearing. Did you have arthritis pain prior to cancer? prior to treatment? or is the arthritis a post treatment problem? When we discovered all the bluish/white clay on our land, I joked with my husband that maybe we should go into the pottery business, what other use was it to us besides being a pain in the backside. We have large streaks that traverse this property. 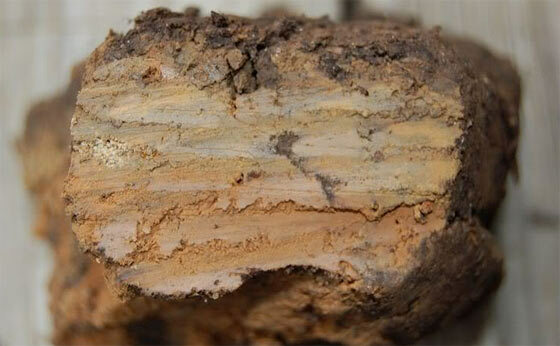 When we had the well deepened, we discovered it has the clay in the well stratus. Know with this new information, guess it can stay right where it is. You’ll have an in-place resource when you need it. Good for trade. People always need plates. Wonder if you could keep ceramics clay and make your own mix? Maybe keep it in a sealed 5 gal bucket for a fallout day? That is not a bad idea, when I owned a ceramic shop with my parents the slip was a clay with a silica in the mix. Check it out, it could just work for you. My own suggestion would be to let it dry and powder it rather than trying to keep it wet. But yes, it’s still clay so it should work. Many years ago, I attended a workshop on soils. We were shown how to take hand full of soil, spit in it until it becomes moist (not kidding) and work it between the thumb and first finger to form a ribbon. The longer the ribbon formed without breaking off the higher the percentage of clay. The more sandy the soil the shorter the ribbon would be when it broke. On the east side of town the soils are more sandy and a 125 HP tractor can pull a 5 bottom -18 inch moldboard plow. On the west side of town you needed a 150 HP tractor to pull that same plow at the same depth and speed. Great Article, this is something that I personally have wondered about and researched a few times. Ken, Thanks for putting this together. I sometimes worry that people have forgotten this danger. I once got excited over finding some potassium iodide and my girlfriend asked why, she then questioned why i would ever need it. When I mentioned accidents like fukashima, she said… are we anywhere NEAR a Nuclear plant. I showed her TWO within driving range. So many people don’t even realize the danger… It just blows my mind. Yes, most have become quite complacent (or not knowing) that there are nuclear power plants dotted across the country (mostly east of the Mississippi). Normalcy bias has set in, and while I certainly hope that the plants remain safe, one should not fool themselves that there is no risk. Something else no one thinks about is where they store/dump the nuclear waste. They have one in Bridgeton Mo. that is currently giving them problems. I think its burning undergroud now.It was the dump for waste from the Manhattan project I believe. There was a program on PBS about the nuclear waste problem. There is one in Georgia on the Savannah river, and another in the four corners area called WIPP. Okay, but now that rainwater has already contaminated soils because of Fuki, how do we know whether or not the clay we buy (I don’t have clay soil and I want to filter all of my water, all of the time, because I live by the west coast), HOW do u know the clay I buy is not already too contaminated to use?